After Simon Singh, Joe Nickell took to the stage to discuss his experiences of going undercover to investigate paranormal claims. Nickell, called by Paul Kurtz “the modern Sherlock Holmes”, creates false personas and then takes part in alleged supernatural rituals. He discussed debunking mediums at Camp Chesterfield, infiltrating the religious camp of Johnny God, being “cured” of made up illnesses by Benny Hinn, and counter-investigating the psychic investigation work of Phil Jordan. In each and every instance, he found it quite telling that no one claiming paranormal abilities could see through his charade. Nickell’s accounts were extremely entertaining and I found it interesting that he claims to have never felt endangered throughout his years of paranormal investigation work. 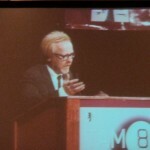 Adam Savage spoke next, reading a speech that he gave upon receiving the Harvard Humanism Award. An atheist, Savage talked about how he feels God is not a prerequisite for knowing how to live the good life. He remarked that good without God is a fact and that “Prayer doesn’t work because someone out there is listening, but because someone inside is – me.” Savage also remarked that while we would like good and evil to be clear cut, it is not; such a desire is banal. 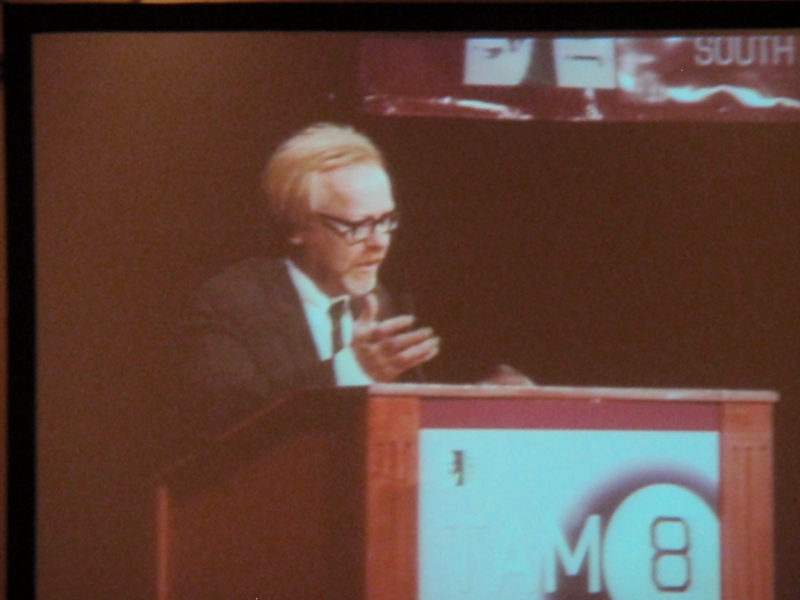 After his speech, a live auction was held to support the JREF, with a piece of the duct tape bridge donated by Savage and co-Mythbuster Jamie Hyneman raising $650. I found Savage’s speech passionate and topical, and watching him run around the ballroom with his auction item held high was an added treat! Astronomer Pamela Gay was up next, discussing Living Astronomy Out Loud, or how everyone can help contribute to the field of astronomy. Opening with data indicating that only 1 in 3750 people in the United States were scientists in 2007 (fewer than the number of clergy), Gay spoke out on the need to increase scientist numbers. 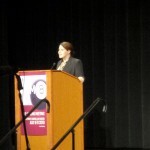 She presented a number of astronomy-oriented websites that anyone can use to categorize universal phenomena, including Galaxy Zoo, Moon Zoo, and Solar Stormwatch. Gay explained that astronomers need this Web 2.0 assistance to expand their research, but also need people to support science in education. Gay voiced concern about the “offensively inadequate” state of science education and explained that some Illinois public high schools cannot offer the minimum number of classes to meet eligibility for the University of Illinois. She concluded by stating “your actions are needed to change this nation” and encouraging everyone in the audience to contribute by supporting science interest and education. Gay’s figures and concerns were troubling to me as a critical thinking in education advocate and something must definitely be done to put the sciences far down on the list of budget cut casualties. Little did we know that the tone and focus of TAM was going to drastically change upon the next guest taking the podium. 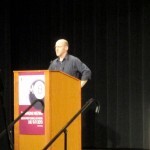 Phil Plait confronted a growing issue within the skeptic community – patronizing, close-minded skeptics. 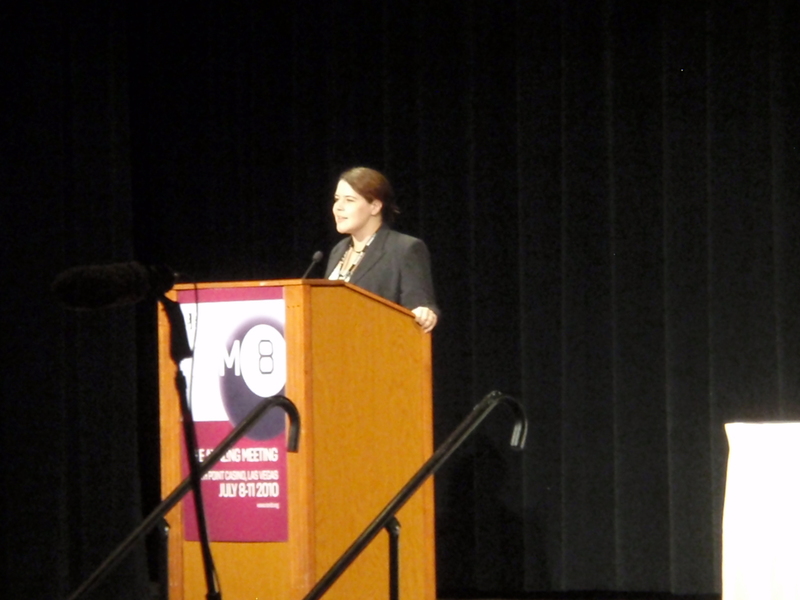 “Vitriol and venom are on the rise” in skepticism, Plait argued, polling the audience about how many people have ever changed their mind because they were yelled at about their beliefs (only a couple hands were raised of over a thousand audience members). He explained how attempts to debunk another’s beliefs only serve to reinforce the belief in question, emphasizing the need to be open and considerate in discussions of belief. Plait posited that the goal of the skepticism movement is to obtain a more rational, real world and that in this endeavor communication is key. While insults may feel good to throw at the opposing side, they do nothing to get the argument across. In closing, Plait said that we don’t need warriors in this pursuit, but diplomats. I could not agree more with Plait’s position and will be discussing this in greater detail in my review of TAM (to be posted after the event summaries). After this rousing and inspirational talk by Plait, social psychologist Carol Tavris gave a talk on Science, Skepticism, and Self-Deception that was much in line with Plait’s message. Tavris discussed what she labels the Semmelweis Problem, which is the refusal to change beliefs and actions despite substantial evidence that existing beliefs and actions are flawed compared to a more beneficial and accurate approach. Three hardwired biases – the bias of being unbiased, the bias that we are smarter/better/kinder/more competent than others, and the confirmation bias – fuel the perpetuation of irrational beliefs. This is true of skeptics as well as believers, especially because skeptics tend to have a self-concept that they are not easily fooled and this can prevent consideration of alternative concepts. Tavris explained that the moment a stance is decided on regarding an issue, justification through the three hardwired biases immediately sets in and considering an alternate perspective becomes perpetually more difficult as biased evidence is accumulated. This is why assaulting another’s beliefs does not work and instead strengthens their beliefs. Tavris concluded by emphasizing that while cognitive dissonance may be hardwired, how we think about decision making is learned and this can overcome close-mindedness and lead to more effective communication. As a supporter of empathetic, open skepticism, what Tavris had to say was greatly appreciated and all the more poignant after Plait’s passionate speech. Finally, a panel moderated by D.J. 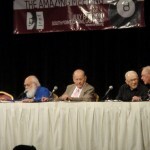 Grothe and featuring Ray Hyman, Paul Kurtz, Ken Frazier, and James Randi focused on The Origins of the Modern Skeptic Movement. 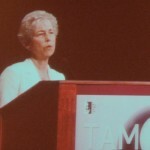 Randi explained that the movement began humbly as SIR (Sanity In Research) and only really took off when their small group started making academic connections. CSICOP (now CSI) was created in the 1970s to combat the irrationalism of paranormal beliefs, explained Kurtz, and when asked if there are less paranormal believers now, Hyman noted that measuring success is difficult and Frazier explained that the instantaneous state of media has altered the situation. 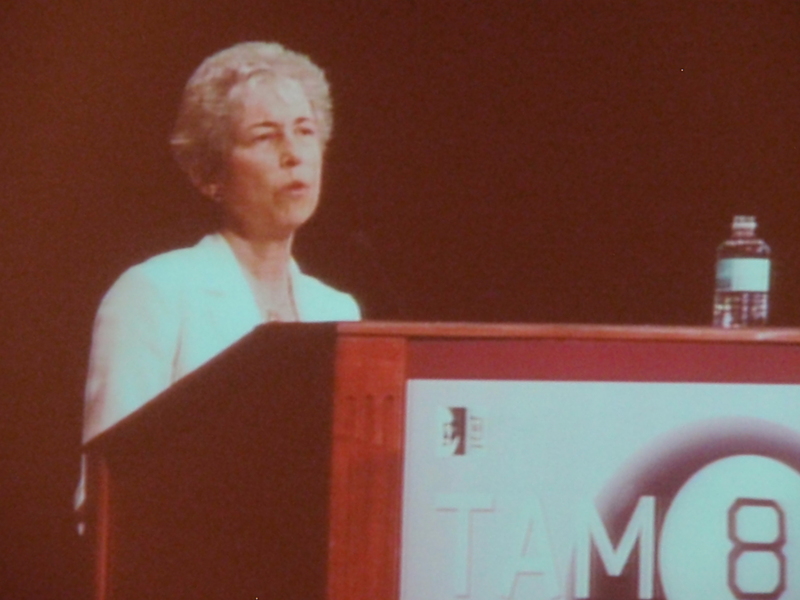 Grothe asked if the fact that over 1300 TAM attendees was evidence of success, to which Randi said yes but it is “a drop in the bucket”. Frazier doubted that irrational beliefs could ever be eradicated, but that it could be curbed much like law enforcement curbs crime. Kurtz interjected that skepticism is a method that must be conveyed as essential and that its emphasis in schooling is paramount. In response to Grothe asking if there has been a shift in the community’s approach, Frazier stated that he does not think there has been a significant change, citing that the focus is still on testable claims. Similarly, Randi reminded everyone that the JREF is not atheist, but will pursue any religious claims that are observable and testable. 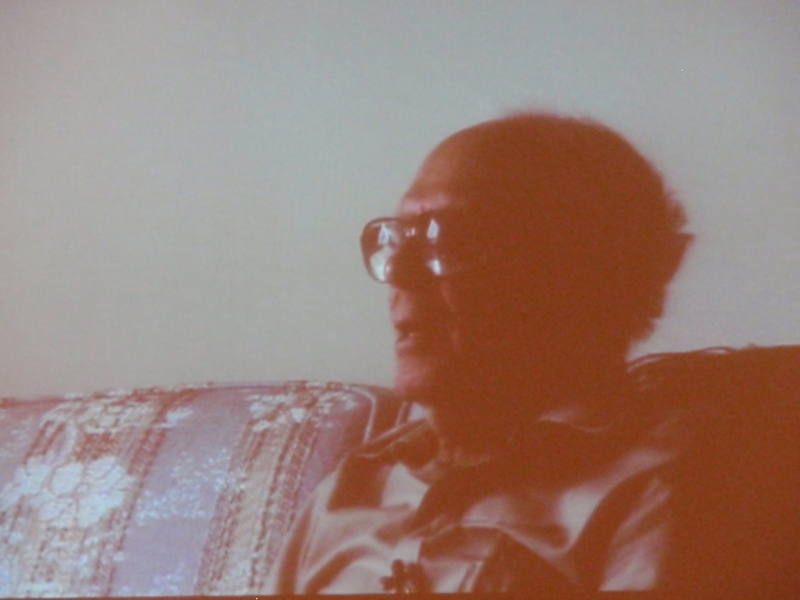 The panel concluded with a video of the late Martin Gardner and Randi giving a speech in remembrance to his close friend and colleague. 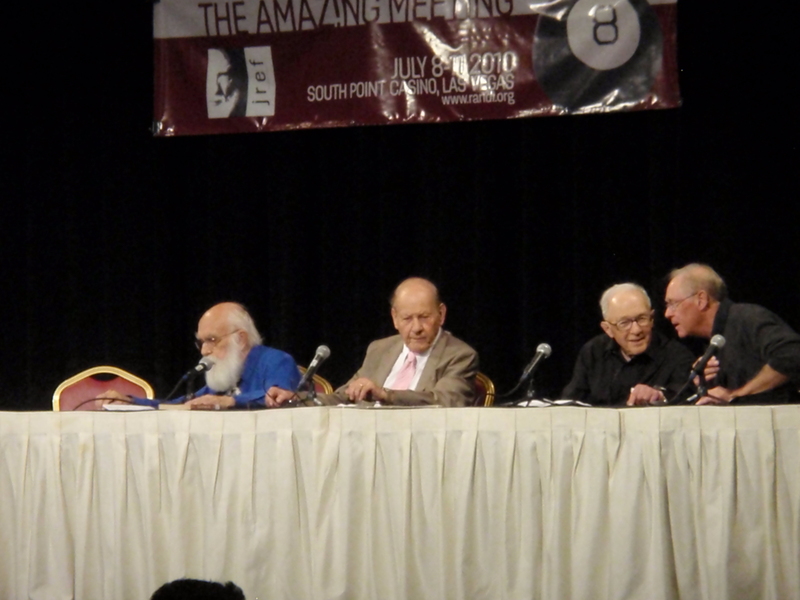 In closing, James Randi presented an award to Paul Kurtz for his decades of work promoting skepticism. This was a very moving and important recognition for Kurtz, who recently resigned from CFI, CSI, and the Council for Secular Humanism to establish the Institute for Science and Human Values. 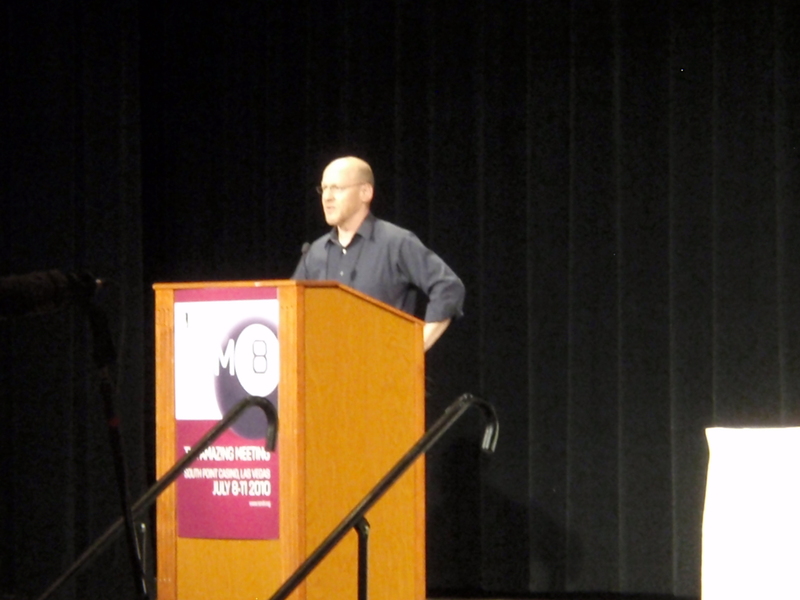 In receiving the award, Kurtz stated that contributions such as his must be ongoing and the skepticism community is obligated to continue the promotion of critical thinking. I am definitely ready and eager to take up this cause and hope that everyone in the audience agrees with Kurtz in this regard. In what is now considered “the golden days” of skepticism, I experienced first-hand the power of grass roots activism. I will never know if or how my view of the world would differ if I had never taken that psychology class in my junior year of high school, but I am very, very glad that I did. When people ask “When did you become a skeptic?”, I have to answer that I have always been one. I never blindly accepted claims and I always looked for evidence. I held my beliefs tentatively. Where I went wrong was in the assumption that the “default” conclusion should be to consider a claim true unless the evidence refutes it. I thought that a lack of evidence meant that I could not draw a conclusion. I was naïve and ignorant. From a very young age, I was fascinated with psychic phenomena. I thought that ghosts were silly; Houdini made that clear. I had seen The Amazing Randi on The Tonight Show, so I knew that Uri Geller was a fraud and I never really bought into the typical magic tricks, anyway. But I was obsessed with ESP (extrasensory perception) and numerology. I had many obsessions, but these were different because I was never satisfied. I read about “cosmic twins” and the predictions of Nostradamus. I studied palm lines. I tried to move things with my mind. I made a set of Zener cards and did my best to test myself and my friends. Nothing ever panned out. Yet it did not occur to me to seek alternative explanations. A more appropriate question than “When did you become a skeptic?”, I think, is “When did you stop believing?” And my answer to that is in October of 1982. My high school in the greater Sacramento area did not offer Latin, but it did have an introductory psychology course and Mr. Tamblyn (now Dr., I see) managed to cover more than I see in most college-level courses. We recreated Asch’s conformity trials with students from other classes. We learned about the Stroop Effect. But what he and a grass roots skeptic taught us about critical thinking was the most valuable of gifts. In early October, we had a guest speaker. She was a psychic. She gave several cold readings, including one of me. She said that she saw me sitting at a piano. Now, I didn’t play piano at the time, but I had wanted to since I got my first organ (they were very popular in the 60s and 70s) at the age of four and my parents hinted that we might finally have space for piano (they gave me an electronic keyboard that year). I was convinced that she was tapping into some unseen energy. She read several other people and we were all suitably amazed. About a week later, another psychic visited us. He surveyed the class, asking how many of us believed in psychic phenomena, and about 3/4th of the students raised their hands. He did several cold readings, some amazing mind-reading card tricks, and a few other feats. He entertained us us for about an hour. Then he polled the class again. Only a few did not raise their hands this time. He showed us how he did a few of the tricks. He explained the method of cold readings. We discussed the way the psychic the week prior may have accomplished what she did. At one point, I looked down at the books sitting on my desk and noticed that I had doodled on one the paper covers – a piano keyboard. I also carried a key ring with a note-shaped fob. I don’t know if either was visible when she was there, but it was not inconceivable. Together, we produced an explanation just about everything that we’d been amazed by the week before. What he had to say next had a much greater impact, though. In fact, it was the end for me. It was the information I needed to finally let go of the nagging question about whether supernatural abilities were real. He told us that he and a few others had founded a group called Bay Area Skeptics. He told us about the challenge. Bay Area Skeptics was founded in June and operated, at that time, as a local chapter of The Committee for the Scientific Investigation of Claims of the Paranormal (CSICOP), now known as the Committee for Skeptical Inquiry (CSI). Bay Area Skeptics offered a $1,000 reward to anyone who could demonstrate supernatural powers. Although this group and challenge was new, James Randi had been offering a reward (which by that time was $10,000) since 1964. The fact that nobody had claimed this money after nearly two decades told me everything I needed to know. The money was there. All they had to do was show their powers. This seemed utterly ridiculous to me and still does to this day. I concluded that the odds that psychic abilities existed were very, very low. Some students were pretty angry about the ruse and the final poll revealed that a few (I think there were 2 or 3 out of about 45) remained believers, but many of us were amazed. Amazed at our own willingness to see what we wanted to see. Amazed at how skilled both the psychic and the skeptic were. Amazed at how little we knew about the evidence (or lack thereof). It was not until well into college that I fully understood that the appropriate “default” conclusion was the null hypothesis, but what happened on that fall day in 1982 was a foundation for that concept. It also taught me that what we do not see can be just as important as what we see. Although I remained an ardent skeptic, over the years my participation in skepticism as a movement varied. At times I diligently maintained memberships in various organizations. I tried Mensa for a while, but was very disappointed to discover that their special interest groups for nonsense like astrology and outnumbered the groups with a rational focus by about 5 to 1. Most other groups were either religious or game-focused. At times I paid little attention to issues of skeptical activism. Eventually, I kind of forgot about that day. Then one day I kind of woke up and smelled the woo. I did not like it. Not one bit. I decided that I wanted to make a difference. That day came in April of 2000, when I attended the annual convention of the Western Psychological Association in Portland, Oregon. It was my first academic conference after returning to school in 1997. I found that it was not all that different from other types of conventions and conferences, but the talks were so much more interesting. I was thrilled to see Michael Shermer and Ray Hyman on the schedule and attended both of their talks. Shermer described the findings of his survey on religion (something I found particularly interesting since I had responded to that survey myself) and discussed his book How We Believe. 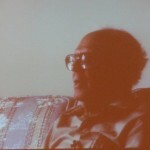 Hyman’s talk was titled Science and Pseudoscience. As Dr. Hyman wowed the crowd with rope tricks and mind reading, all of the memories of that day came flooding back, but I could not recall the skeptic’s name. 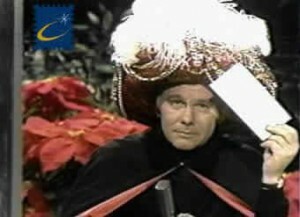 Dr. Shermer and Dr. Hyman speculated that it was Bob Steiner and James Randi offered the same guess later in an email. However, the internet eventually provided enough clues and I now know that it was Terence Sandbek, a clinical psychologist and professor at American River College. The list of people who have helped to shape my philosophy is not short. I feel especially grateful to Dr. Donald Butler, who taught me the basics of statistics and epistemology (and always had copies of the Skeptical Inquirer to thumb through) and to Dr. Brennis Lucero-Wagoner, whose insights and inspirations on teaching are second only to her friendship. I also have a few heroes – people whose successes I might mistake for miracles if I did not know better. It is not possible to measure the effects of Dr. Eugenie Scott’s work at the National Center for Science Education, but the thought of a world in which religion passes for science in public schools is disturbing. Dr. Rachael Dunlop has been instrumental in the fight against anti-vaccination propaganda in Australia, driving the ill-named Australian Vaccination Network to close its doors recently. These are huge wins and they clearly demonstrate that activism works. But I do not know if I would have come to appreciate these people if it were not for the work of a skeptic and a high school teacher. I can think of no pursuit as rewarding and valuable as the study, promotion, and teaching of critical thinking, science, and skepticism.